Can you handle the big balls? Find out in this tricky platformer. If you enjoy watching contestants risk life and limb while navigating their way through humongous obstacle courses, Wipeout definitely helps scratch that itch. 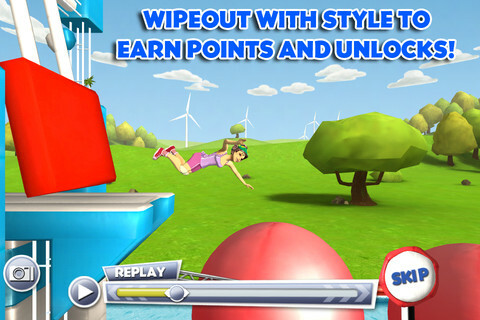 Based on the popular ABC television series, the game lets you take control of different contestants with unique abilities as they jump onto ramps, bounce off giant red balls and avoid a variety of hazards in a desperate race against time. Controls are a bit iffy, but online leaderboards and a fun mix of courses will keep you entertained. On that note, the game's primary mode challenges you to complete a season of Wipeout by mastering each course while at the same time earning style points for doing all manner of things, like super bouncing off those dreaded big balls to getting hit with padded bumpers. You only have three chances to complete a circuit, so mastering each board is key to success. That, and having great timing so you avoid getting knocked into the water, costing you a life, so to speak. Succeed, and you stand to gain more Smallsy Coins and/or Ballsy Bucks, which you can then use to purchase new characters and helmets. What do helmets do? 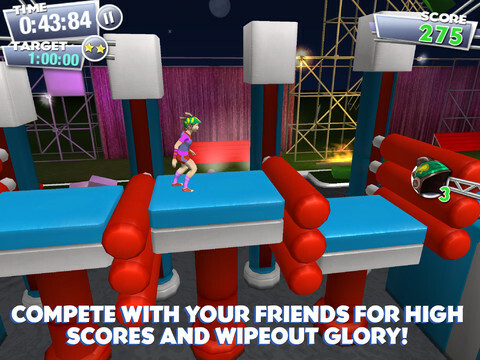 Imbue your obstacle course runner with a super power, like slowing down time, running faster and jumping higher. You can even unlock new courses, though it'll take some grinding. That said, and while the game is enjoyable, the controls definitely get in the way. Sliding our left thumbs to run works well enough, but using our right thumbs to slide and dive after a jump is an exercise in frustration that more often than not results in, well, wiping out. As for the red bouncy balls, they are by far the most annoying parts of the game, since it's tough figuring out the exact area to land so the character gets propelled (safely) to the other side. Thankfully, these issues don't ruin the game per se, thanks to the inclusion of leaderboards, Facebook/Twitter integration and a Time Trial mode. Wipeout isn't perfect, but it still delivers enjoyable platforming that'll only get better with the inclusion of future updates. For now, it's still worth $1.99. What's Hot: Does a fine job capturing the spirit of the show, a cool variety of obstacle courses, different characters and helmets to unlock, online leaderboards. What's Not: Tough pulling off the more complex maneuvers, tricky balls.